The following account was written by Baroness Nicolette and Baron Colin of Carolingia of the court they held in Carolingia last month and is reprinted with their permission. The Gazette invites the heralds or territorial heads of groups to submit their own court report and thanks Their Excellencies Carolingia for allowing up to print theirs. As our Court Herald was unable to attend the event, Sir Michael of York graciously took on the role for the afternoon court. Per our request, we were preceded into court by all the attending warranted marshals, as we wished to introduce the populace to the folks who give up the thing they most enjoy doing so that others may participate. Lady Sorcha Dhocair inghean ui Ruairc awarded prizes to several children who participated in the many children’s activities organized by Lady Abigail the Younger and herself. Lady Creiddylad, who organized an inspiring Arts and Sciences Display and People’s Choice Award, announced the winners, Laurie and Richard, for their beautiful hand-carved wooden spoons, including reproductions of those from the Mary Rose, and also read off the names of all the participants and their entries. Master Peter the Red presented a gift, which he had received anonymously, to the most improved archer over the course of the day. Baron Christoff Gockerhan von Loch was thanked for his long service as Carolingian Baronial Thrown Weapons Champion, and turned his regalia over to the new champion, Lord Pandulf. 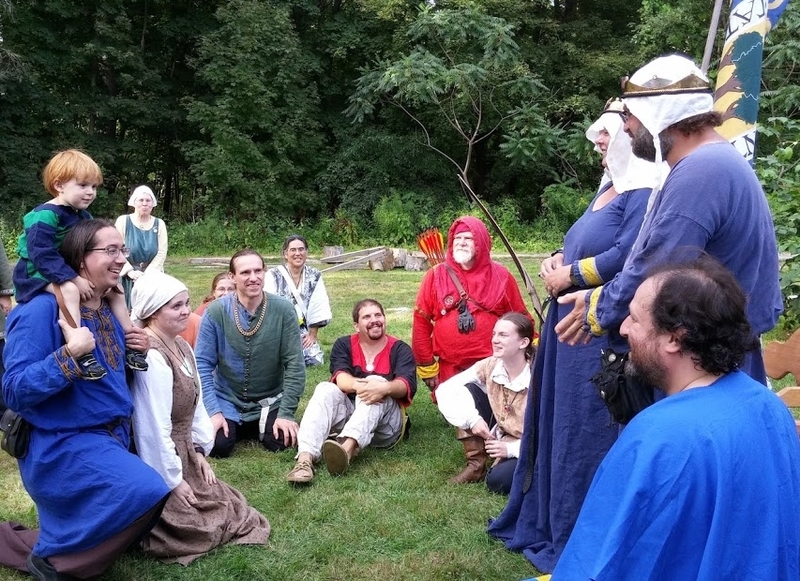 Master Kobayashi was also thanked for being willing to step into the role of Baronial Archery Champion on short notice (as the Baronial Archery Champion became Baron), and turned his regalia over to the new Archery Champion, Cathain. The Archery regalia included the quiver of Marion of Edwinstowe, founder of the Carolingian Company of Bowmen – while we are sure she would be amused to know that her quiver is still given to each champion, her loss is still felt keenly and we miss her terribly. 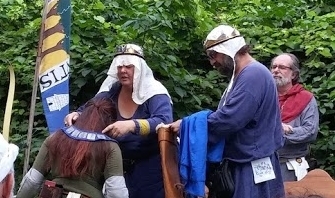 Then Lord Ulrich Reinhart read the Award of Arms scroll for Lady Gudrun, for which we received Their Majesties’ permission, as Lady Gudrun had been unable to attend Investiture when the scroll was originally presented by Their Graces Edward and Thyra. 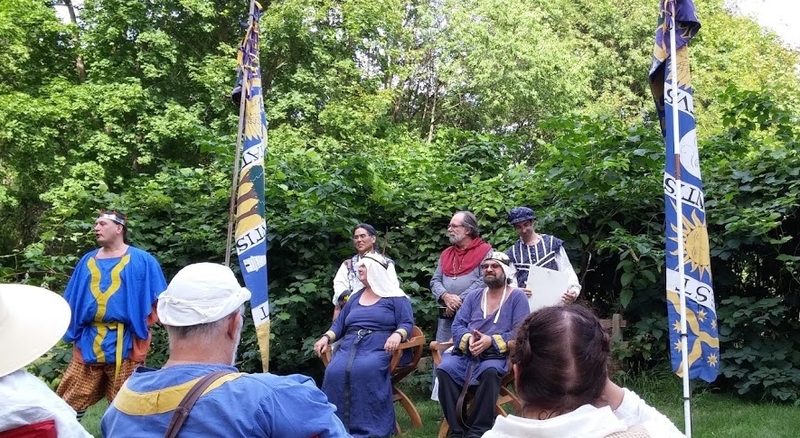 Lastly, we were delighted to induct the following new members into the Order of the Perseus, Carolingia’s martial prowess and service award, at the recommendation of the Order: Eric Michaelson, Asher of Lincolia, Christopher Michaelson, Simon of Barnsdale, and Dierdre of Mitgaard.